High-water content foods are not only hydrating, but refreshing, too. Consuming a lot of dry foods like processed carbs (i.e., bread, pasta, and crackers), dried fruit, and junk food can slow down your digestion and leave you feeling not as optimal as nature intended (aka. sweet and juicy!). Eating foods that help you stay hydrated is important not only for thirst-quenching effects, but to improve your total state of well-being. After all, our bodies are 60% water. Being properly hydrated is important, especially if you are looking to lose weight, clear your skin, or get rid of fatigue. 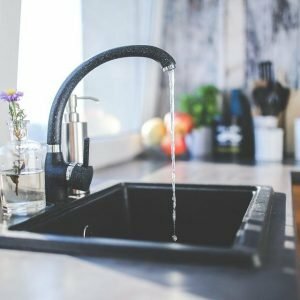 Although 20% of our daily water intake comes from solid foods (mainly fruit and vegetables), it is still important to drink enough water throughout the day. As a rule of thumb, I drink 1 litre of water, 4 times a day, 30 minutes before I eat. I drink 1 litre upon waking, 1 litre before lunch, 1 litre mid-day, and another litre before dinner. 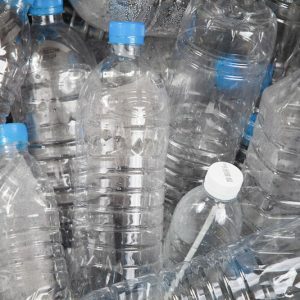 Sarah Smith did an experiment on drinking a gallon a water every day (like I’ve been doing for over 5 years) and received countless benefits from improvement in bowel movements, clearer urine, less skin breakouts, no more headaches, less joint stiffness and healthier eyes. The list goes on. 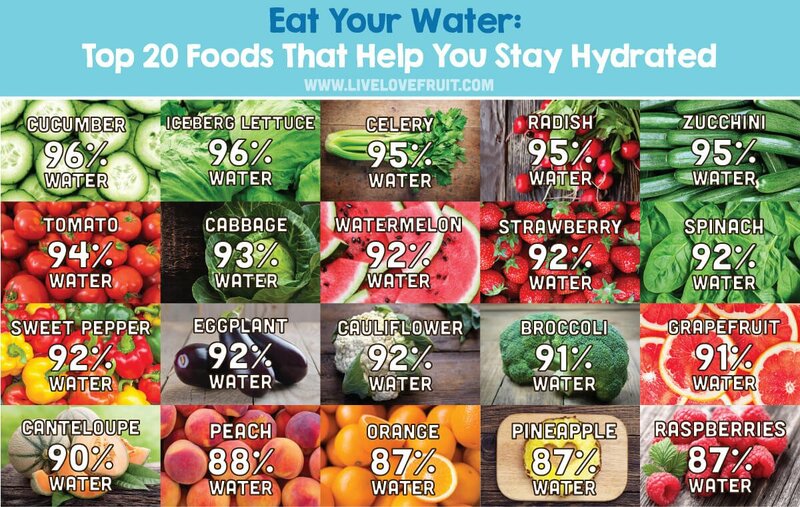 Here are 20 foods that will help you stay hydrated, most of them (give or take 3) that are over 90% water by weight. The top of the list – the almighty cucumber – one of the most water-dense vegetables. That doesn’t mean it lacks nutrients, though. This vegetable contains multiple B vitamins (B1, B5, and B7). B vitamins help nourish our nervous system, and reduce feelings of anxiety and stress. Ever since kale stepped into line, iceberg lettuce was shunned into darkness. However, this leafy green is actually incredibly nutritious, providing the body with bone-nourishing vitamin K and vitamin A for health of the skin, eyes, and blood. It is also high in fibre, and provides more water than any other lettuce, making it perfect for hot summer days. High in water, celery provides only 6 calories per stalk, but is loaded with folate and vitamins A, C and K. It has also been found to reduce blood pressure, and contains 8 anti-cancer compounds that help fight against many forms of cancer. This tasty snack vegetable is not only high in water, but is a great source of fibre, vitamin C and B6, and minerals like zinc, riboflavin, potassium, copper, magnesium, manganese and calcium. They also make great mucus-busters, for those dealing with hefty coughs or clogged sinuses. One of my favourite vegetables (although technically a fruit, because it comes from a flower), the zucchini, also happens to be incredibly rich in water. Not just that. This vegetable (fruit?) also contains 8% of your daily recommended amount of potassium, meaning it is great for your heart by helping your blood cells function better, protecting against clogged arteries and lowering blood pressure. It also makes a great substitute for pasta when using a spiralizer! Tomatoes also make the list of the top 15 water-dense foods. They’re a great source of vitamins A, C and folic acid, and contain lycopene, an antioxidant that gives tomatoes their red colour, and has been found to significantly reduce the risk of prostate cancer. This cruciferous vegetable has been a staple food for many throughout history – and for good reason too. Cabbage is not only 93% water, but it is a powerful anti-inflammatory, helps clear problem-prone skin, heals stomach ulcers, improves the immune system, and slows cancer cell growth. We’re all aware that watermelon is high in water – that’s why most of us turn to watermelon on a hot summers day. 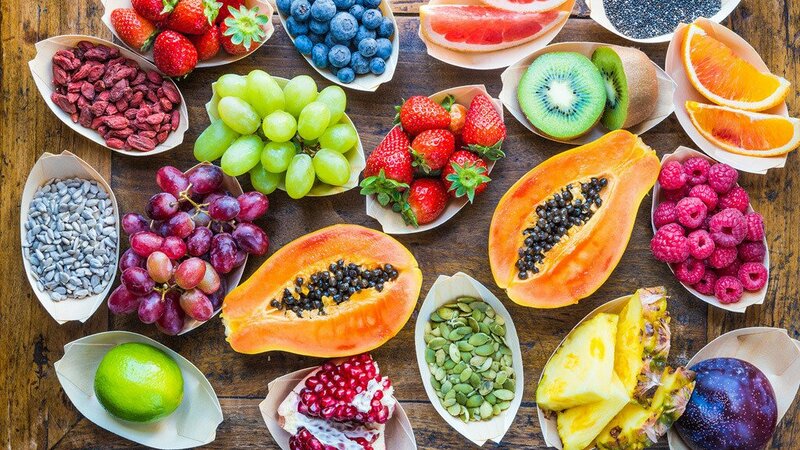 It is by far, one of the most powerful, body-healing fruits out there, with benefits ranging from reduction in body fat, cardiovascular-strengthening effects, anti-inflammatory effects, kidney support, and helps alkalize the body. Another water-dense fruit, the strawberry, also happens to be high in phenol antioxidants that help protect against cancer, promote heart health and act as potent anti-inflammatories. Although spinach isn’t as high in water as iceberg lettuce, it contains a higher concentration of nutrients like lutein, potassium, finer, and brain-boosting folate. Not only that, but 1 cup of spinach contains 15% of your daily intake of vitamin E, which prevents the propagation of free radicals in tissues, and plays a role in smooth muscle growth and neurological functions. All peppers – green, yellow, orange, red and purple – contain plenty of water, but green peppers are a bit higher (closer to 94%). Peppers make a great snack and they make an excellent source of carotenoids and vitamin C to help power and support the immune system. These large, oddly shaped vegetables make great substitutes as a plant-based “burger” when marinated with herbs and spices, and can also be made into a raw eggplant “bacon” if you own a dehydrator. Aside from its wide culinary uses, eggplant contains a broad range of nutrients like vitamins C, K and B6 and minerals like potassium, folate, manganese, phosphorous, calcium, copper, thiamin, niacin, magnesium and pantothenic acid, all of which help the body fight off various disease. I was slightly shocked to discover that cauliflower was so high in water. It also happens to be a nutrition superstar, helping to improve digestion, reduce stroke and high blood pressure, combat age-related memory decline, reduce inflammation, support the body’s detoxification system, and inhibit the growth of cancer cells. This tasty cruciferous vegetable packs the most nutritional punch of any vegetable and is quite literally considered a miracle food! 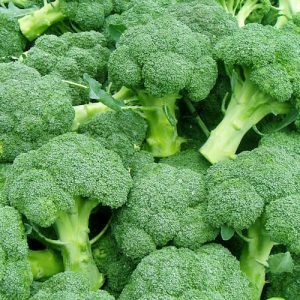 It is high in calcium, protein, folic acid and vitamins A and C. It also contains one of the best cancer-fighting phytochemicals in the plant-food world called sulforaphane. Sulforaphane helps increase the activity of a group of enzymes in our body that kill off cancer-causing agents. Most citrus fruits are naturally high in water – that’s what makes them so sweet and juicy! They contain a whopping amount of vitamin C and are relatively good sources of copper, vitamin A, pantothenic acid, finer and potassium. Fresh grapefruit juice in the morning makes a great coffee replacement! This succulent melon contains 2% less water than watermelon, but is still, nonetheless, a great water-dense fruit. It is packed with nutrition, with just 1/4 of a melon providing you with 100% of your recommended daily intake of vitamins A and C! I love making melon smoothies. Try blending cantaloupe with a little bit of lemon and ginger for a satisfyingly sweet and sour smoothie. These fuzzy globes of deliciousness help hydrate your body, as well as protect against cancer, aid in weight loss and heal the heart. Make sure you eat organic peaches, however. The conventional peaches are sprayed with a lot of pesticides. Just like grapefruit, oranges are naturally high in water, but rank a little lower than the grapefruit. Oranges are incredibly body-healing, vibrating with only the purest of life energy. They help clear out mucoid plaque (thanks to their citric acid content) and help lower blood pressure, alkalize the body, improve digestive health and lower cholesterol among so much more. The pineapple might only be 87% water, but it is one of the best anti-inflammatory fruits out there, thanks to bromelain, a proteolytic enzyme in pineapples that helps reduce pain and swelling and eases discomfort in those suffering from arthritis, inflammatory bowel disease, sinusitis and inflammatory skin conditions (acne, eczema, rosacea, dermatitis and psoriasis). Lastly, we have the raspberry. These tasty little fruits are among some of highest-ranking plant foods in terms of water content. They have been researched for their potential in management of obesity by increasing enzyme activity, oxygen consumption, and heat production in certain types of fat cells. That, PLUS they are high in antioxidants for total body-healing effects.